Alpes Lima, Lima, Peru : Rezerwuj teraz! Air conditioner in dorms and private rooms available! Free walking tour to downtown lima & free yoga on mondays. 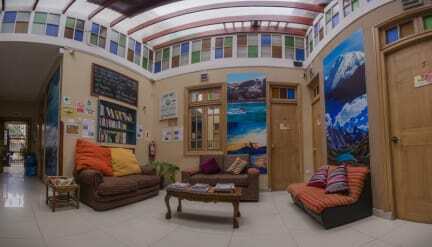 Just a few steps away from the oceanfront - "parque del amor"
Situated in the heart of the safe Miraflores neighbourhood we are one of the closest hostels to the beach, just a 5-minute walk to the ocean front. Only 4 blocks to Downtown Miraflores - Kennedy Park & 3 blocks from 'Larcomar' mall, (where you can find the best restaurants, shops, cinemas, clubs, bars, bowling, etc.). Alpes Lima has a large roof terrace with a bar to relax and enjoy a drink - we have happy hour every evening and throw sometimes our famous BBQ nights. There is also a TV your disposal to watch your favourite sport games. Some nights we all go out to a club with bracelets for free entrance. We have a common area with computers, free Wi-Fi, a fully equipped kitchen and a book exchange. We offer private rooms with shared and private bathroom and dorms from 4 to 8 people. Each bed comes with individual reading light, power socket, and his own locker. All the rooms have a modern private bathroom, with 24-hour hot water. Check in at 12:00, if we have beds available you can check in earlier if not you can keep your stuff in the storage room until check-in. Payment upon arrival by cash, credit cards, debit cards. (This property may pre-authorize your card before arrival).